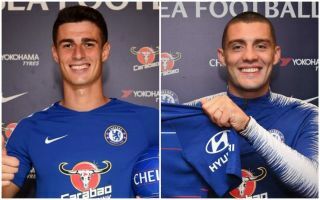 Chelsea have confirmed the squad numbers for new signings Kepa Arrizabalaga and Mateo Kovacic after their late summer transfer window moves to Stamford Bridge. Kepa replaces Thibaut Courtois as the first choice in goal, and as such has been given the number one shirt, though rather confusingly, Courtois had actually held the 13 jersey before his move to Real Madrid. Backup ‘keeper Willy Caballero has now changed to 13, allowing Kepa to be official no.1, while new midfielder Kovacic, who is spending the season on loan with the club, takes the 17 shirt. Fellow new-boy Jorginho had already been confirmed as taking the number 5, third-choice ‘keeper Rob Green gets 31, while Alvaro Morata also changed from 9 to 29 for this season, with the full list now up on Chelsea’s official site. Chelsea fans will no doubt be eager to get some of these new names on their shirts for the 2018/19 campaign, with the squad looking strong and giving supporters hope of improvement after last season’s disappointing fifth-place finish. Maurizio Sarri has come in to replace Antonio Conte as manager, and though losing Courtois is a blow and CFC could perhaps have done with a new striker, the additions of Kepa, Jorginho and Kovacic look promising.